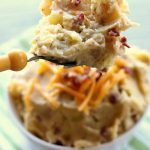 Creamy buttermilk garlic mashed potatoes with grated cheddar and bits of bacon made easy in your slow cooker. A perfect side dish for your Easter dinner. Place potatoes, water, garlic, bay leaf and salt in slow cooker. Cover and cook on LOW for 4-6 hours, or until potatoes are tender. Drain potatoes and discard the bay leaf. Mash the potatoes with a potato masher or a fork. Stir in the butter and buttermilk. Stir in cheddar and bacon. Stir in salt and pepper to taste.